Sometimes a conversation started on a slightly ‘wrong’ footing, leads to the most wonderful journey of discovery. 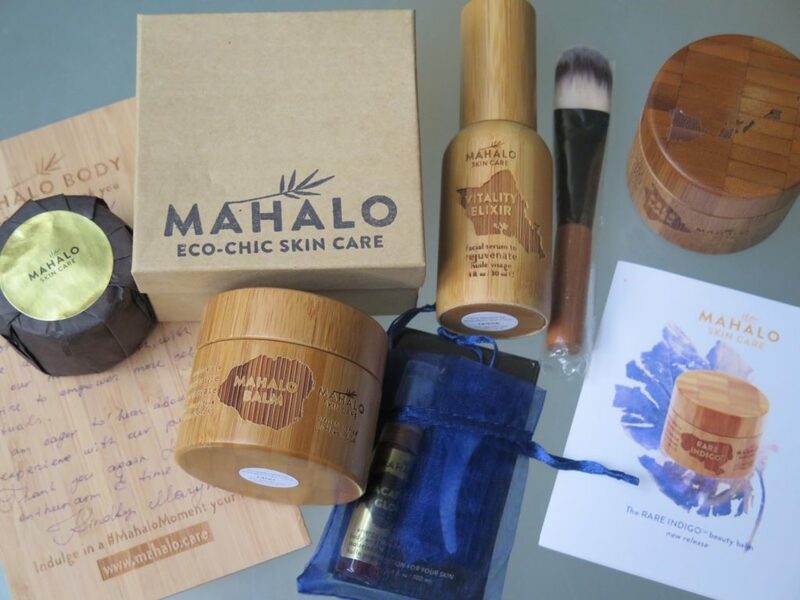 This post is dedicated to one such story and has Mahalo Skin Care at its heart. Several years ago I wrote a post about a skincare brand called Tay (since then the brand has sadly been discontinued, for reasons unknown to me) and one of the things I liked about it was its packaging. A while later I came across a skincare brand from Kauai, Hawaii’s Garden isle, called Mahalo Skincare, and their bamboo packaging jars were a little similar to the Tay ones. I made an off-the-cuff remark about it and had the loveliest reply from the brand’s founder Maryna Kracht, who told me that they had the same manufacturer. Then things have gone quite. Some more time passed by and towards the end of last year Maryna dropped me an e-mail, introducing herself and asking whether I wanted to find out more about her brand and skincare. Whatever is being said about fraught relationships between Russians and Ukrainians, certainly doesn’t apply to Maryna (who was born in the Ukraine, has moved to Canada aged 19 and to Hawaii three years ago) and myself ( born in Moscow, currently living in London ). I loved reading her e-mail, was suitably interested, knowing innately that there is much more to this brand than the choice of containers (they are beautiful by the way and are part of the appeal of the brand, as when you have used the products you can use the jars for travelling or to keep sentimental moments or rings in ) and have sent Maryna an affirmative e-mail. We continued our e-mail conversations. Maryna went on to explain that Mahalo products are ‘made by hand using non-toxic and organic ingredients. The line is formulated by me and my sister, with my darling husband being the shoulder support in business and daily routine. My passion for plants goes back to my roots, and I owe all of it to my babushka. She was the one that inspired me to begin to travel at a very young age and expand my knowledge for the alternative medicine / skin care. I have traveled to India (five times now), South America, Europe and am now settled in Hawaii. Each place has brought its own flair, which then manifested in Mahalo Skin Care. My heart and soul have gone into the development of Mahalo and I really hope it will bring a tremendous amount of joy, transformation, and empowerment to everyone who gets to pamper themselves with its magic’. With every e-mail exchange I was becoming more and more curious about the story. And then Maryna’s parcel arrived, smelling exotic and heavenly, even before I opened the outer packaging. The beauty that revealed itself once I opened the box, made my eyes well up with tears, as it was one of the most special gift boxes I have ever received. Even now, thinking of that moment, brings immensely happy memories of exploring the contents of Maryna’s parcel and inhaling each product’s aroma, of cradling the beautiful ceramic bowl in the palm of my hand and passing the brush against the curves of my face. Early on in our e-mail exchanges Maryna mentioned something that I think really sums up the essence of Mahalo: ‘One of the big reason I was inspired to create MAHALO Skin Care was putting a wide smile on people’s faces, offering a transformative difference that empowers, enlightens and makes you pause for a moment and feel gratitude (Mahalo is a Hawaiian word for thanks / gratitude)’. Having used the products for a couple of months now, I can chirp in and add my own five pence, by saying that this is actually true. At least for me. The Rare Indigo Beauty Balm: for the past months (actually the vision started years ago), Maryna has been working on a new product, which is finally ready to meet and treat the thirsty complexions. The new balm boasts an array of luxurious ingredients, with the star being the indigo extract, which also extends it’s magic in providing a unique indigo-violet color (a color that is unique to the organic beauty world). Being high in linoleic acid, the balm is bursting with formidable anti-inflammatory phytonutrient infusion, collagen-fostering vitamin C ester, high-content of antioxidants and replenishing essential fatty-acids. The aroma is on a sweet side, finished with luxurious iris, tansy and ylang ylang. When you first smell the balm is has a strong aroma but as it melts into your skin and is warmed up by your skin, you experience euphoria that lasts as you get on with your day. It is uplifting and joyous and makes me feel like I can take on the world, even when it is grey and cold outside. There are 21 high performance ingredients in this balm, which together help to moisturise and hydrate your skin, heal the skin, withstand oxidation stress from environmental aggressors, as well as protect the skin from the elements like wind, calm the skin if you suffer from skin conditions like acne, eczema, rosacea or dermatitis and plump it up as well. Dip you clean fingers into the pot ( mine was a sample pot but more on the new packaging further down below in the post ) and massage it into your slightly damp skin, while inhaling its potent aroma that is calming and levitating at the same time. Om ! Pele Mask: as of February 14th, Mahalo will have two masks in their line. The Pele Mask that I got to try ( a dry powder detox mask ) and The Petal ( a beta-hydroxy hydrating mask formulated with honey, rose, jasmine & hyaluronic acid – worth the wait, it certainly stood out for me ), which will be launched in time for Valentine’s day, as Maryna created it with the intention of self-love & pampering. The Pele mask has Big Island of Hawaii map, as the story and the intention of the mask has strong ties to the story of Hawaii. Imagine glorious mountains tower about valleys and waterfalls, poetic cliffs looming over the Pacific and surf entering secretive bays – all that can be found in Maryna’s Instagram account and makes you long to discover various Hawaiian islands secrets. But back to the mask now & its description by Maryna: ‘Pele is the volcanic goddess that created the Islands, and the Big Island of Hawaii has a currently active volcano. The first ingredient in the mask is the Volcanic Ash Clay, then the list of botanicals have a lyrical connection to the creation of Hawaii as well. Cacao, bamboo, hibiscus, papaya, noni, turmeric, ginger, pennywort, sandalwood, banana, guava etc – all these ingredients are now an intrinsic part of Hawaii, and they owe their potency to the mineral rich soil provided by the volcano, the Pele. Pele has a fiery and cleansing spirit, which is also a part of the Pele Mask, the effect when you add water and the powder begins to swell and sizzle. In creating this product, it was important for me to connect the intentionally selected high-performance ingredients to the story of the land where this product is born’. On days when you skin looks grey and tired, take the time out in the evening to nurture your skin back to radiance, as Pele will tighten the pores & oxygenate your complexion. Put 1 tsp of dark grey powder ( it has a delicate flowery smell ) into a bowl and mix it with an equal part water ( you can also use honey if less heat is required). The mixture will swell and bubble, making you feel like a teen experimenting in school’s chemistry lab. Once you have a smooth, mousse-like paste, brush it on your face, excluding the delicate eye area and notice your complexion warming up and tingling until the mask dries up ( you can keep it on for between 20 to 40 minutes, depending on your skin’s needs and type ) and then wash it off with warm water (I use a bamboo muslin, making it easier to remove the mask), revealing baby-soft, plump, clear, refreshed complexion, with diminished signs of tiredness. Tip: you can also use it as an immediate spot treatment. My Pele mask came in a 50 ml jar but this year Maryna also plans to offer it in a 100ml jar. The decision to offer a large size came from reading numerous comments, feedback and testimonials of Mahalo clients, who expressed desire to have a larger size of the mask. In Maryna’s own words: ‘we do what we do for you – our customers and supporters, so we make adjustments where we can to suit your needs’. The tamanu and chia are the two leading luxurious oils of the serum, both lightweight, both very potent. The positive note here is that the latest batch of Tamanu oil is much lighter in the aroma, so the smell will be much smoother. Plus with the relaunch of the updated packaging, Maryna was going to slightly ‘fine-tune’ the formula with the addition of bergapten-free (non-photosensitizing) bergamot oil, to give the elixir a more rounded and lighter smell. Bright yellow in colour, this elixir feels luxuriously cooling on the skin and can be used both in the morning and the evening. I prefer to use it in the morning, in part because of its potent smell that wakes up my senses. After cleansing or double cleansing, get two pumps of the facial serum on to your fingers, let it ‘warm up’ by the heat of your fingers and spreading it all over your face, with the skin slightly damp. You can extend this serum to your neckline and upper décolleté and you can add a tiny bit to your eye area and let it work on dryness, small wrinkles, puffiness and dark circles, if you are prone to them. The Vitality Elixir can be used on all skin types and can be particularly beneficial for skin prone to redness, irritations, acne and mature skin. Top tip: if you feel like your skin needs some extra nourishment, mix this elixir with a tiny amount of Mahalo balm and apply to your face but omit the eye area, as it might be a little too ‘rich’. p.s. for me it was one of the ‘strongest smelling’ of Mahalo products, which initially I did find a bit too much but over time, using it ‘lightly’, I came to appreciate its nurturing effect on the skin, particularly when combined with balm. Lightness of touch is the secret to getting the most of this product. Mahalo Balm: the colour of this balm reminds me of ripe pumpkins sitting in the warmish autumn sunshine. One glance at its vibrant shade is bound to put a smile on your face. This potion focusses on regenerating the skin from the molecular level by engaging the arsenal of anti-inflammatory Turmeric, sebum-balancing Macadamia Oil, acne-fighting Tamanu Oil, tissue-repairing Carrot oil, eczema-soothing Neem oil, hydrating and scar-soothing Rosehip oil, skin-toning Grapeseed butter and skin protecting and humectant Kauai Beeswax. it was formulated without water and melts on touch to a golden fluid that when spread on your face and used regularly will protect your skin, as well as sooth and moisturise the skin. Using it in winter has been particularly interesting, as I over the last few years I have come to appreciate balms for their nurturing and soothing powers and at times they seem to moisturise the skin better. The herbal infusion of bergamot, lavender, geranium. patchouli, as well as Hawaiian sandalwood and jasmine uplift the senses when the weather is cold or stormy and when the mood gets cloudy too. I like using this balm to hydrate my under-the-eye area – just make sure the lightness of touch and only a tiny bit of a product. It allows your ring finger to slide around the orbital bone, thus preventing puffiness setting in. Maryna also recommends using it as a lip balm, as it is good for soothing irritated or dry skin. In addition it helps to regulate sebum production and gives you a more balanced complexion, while protecting the skin from environmental damage. Vacation Glow: Maryna has sent me a small sample of this dark orange body and hair oil, so I can’t write a long aude to it but it certainly enjoyed it’s lighter than other products smell, a more flowery notes which left me feeling more energised and in high spirits, which was particularly welcome by the pasty winter skin post shower. It left behind a delicate flower veil that somehow made me feel more pulled together, particularly after using it on clean skin post-workout. Combining super skin loving Macadamia, Kukui and Avocado oil with repairing sea buckthorn ( one of my favourite vibrant and health benefitting berries ) and COQ10 this oil should allow for better energy flow between your body meridians, releasing energy blockages ( particularly good if you start the day with dry skin brushing, jump in the shower and then apply this oil to slightly damp skin – in my case I can only do it during the weekends, as other mornings are spent in a rush where I give preference to a hearty breakfast and swift make-up application instead or a luxurious body pampering ). In the note accompanying the vial of this product it says that ‘Vacation Glow is infused with subtle energy that supports the body’s natural ability to maintain heart and circulatory body functions, support the nervous system and assist with bio-molecular and restorative functions’. In short, this a Mahalo product I definitely would want to get better acquainted with. Aromas of Mahalo products: this is something that I wanted to talk about separately because most of the products do have strong smells, which might not be to the liking of some of you. The aromas are multi-layered, evocative, beautiful but if you are senstitive to smells, the products might not be for you. For example, I let Maryna know shortly after receiving her parcel, that while I was riveted by the smell Rare Indigo Balm, it has a multi-layered smell. Maryna replied that ‘its aroma can change depending on the temperature, humidity and application on the skin’ and you should bear that in mind because we all respond and like to different smells and while one might be enamoured, another might prefer something blender or more subtle. From my own experience I can say that Mahalo do their best to listen to what the customers are saying by seeking feedback, reading reviews on blogs, forums, social media, etc. Additionally Maryna added the following: ‘There is a small percentage of people for whom the aroma is either too strong, unfamiliar (especially to those new to natural skincare) or is just not their preference. The interesting aspect of the Rare Indigo balm is that the aroma was actually the bonus of the development process. This multi-layered, complex smell was not our goal, our goal was to find the best ingredients that fulfill our quest for the youth-enhancing, anti-inflammatory treatment that is concentrated, potent with essential fatty acids, vitamins and minerals. I believe this is also the reason why you can’t really highlight a specific smell, because the essential oils, absolutes and extracts are selected for their ideal bio-dynamic performance. They work best when they are together and they create something better than each of them on their own’. Treatment mini bowl and bamboo brush: those two items are something that I was utterly smitten with as soon as I got them out of the packaging. The brush is comfortably sturdy & compact, so you can easily have it in your make-up bag or use it to apply a mask to your face ( or your make-up ) and glides beautifully over your face. Last but not least an update on the packaging. In my images you can see Mahalo’s usual packaging but as of latter part of January, Maryna has started introducing the new packaging, removing the white plastic from inside the bamboo jars and replacing ше with glass. This has been a year-long Mahalo mission and Maryna is particularly excited that they finally have the capacity to be even more eco-friendly and chic. This is a larger undertaking, as the glass & bamboo assembly will now be fully handled in Mahalo studio, allowing the team an even more intimate connection with each productб before they are sent to customers and retailers. For now the laser engraving is in the final process, with the verbiage and logo being engraved semi-manually, using a laser machine with feeding each jar to the engraver by hand. After that the bamboo outer shell is hand assembled with the glass jar by Maryna and team Mahalo. When I hold one of Mahalo products in my hands I feel a reverence-like emotion, knowing what incredible amount of creativity, love, knowledge and carу goes into them. One very personal, artisanal brand. What a lovely detailed review, Galina! Maryna cound not have found a more thankful person, your review is so heartfully written. I did not want to read it in a rush so I took my best time to enjoy all little stories behind each products. Hope one day to be able to try Mahalo, this brand is very high on my wish list. Love the idea of mixing oil and balm! I admire Maryna and her courage to follow babushka’s lessons. If we all have that level of inspiration in our younger years. Out of all these products which one impressed you most, Galina? dearest Elena, thank you for leaving such a wonderfully touching comment, I am so happy you liked the review. Thank you for taking the time to read it in increments, I actually took quite a few weeks to write it, reflecting, talking to Maryna, using the products, experimenting with using them in different ways. I admire brand founders who follow their own path, are very distinct in what and how they do things. Thank you very much, Galina. The Rare Indigo Balm seems to be a highly successful product getting only rave reviews from green beauty bloggers. I know you are very picky and do not rush to fall in love with each and every product. Morever it is great to know that you are fond of this balm. I ordered quite a few Mahalo Skin Care products about a month ago. When the shipment arrived, one of the jars were leaking and I couldn’t open 2 of the jars. I contacted the customer care line online and via e-mail and the lids were still stuck after everything that I tried. The customer care representative promised me replacements and I received nothing. I followed up again and she said they are in Vancouver and I still received no products. 1,5 weeks later upon threatening to provide this feedback with every green skin care influencer, they are now committed to sending me replacements and a shipping label for me to return the two faulty products. I paid over $600 for this pain and I would like trusting customers to be cognizant of this company’s attitude even if it’s an isolated incidence.